Audience: This book is intended for children ages 4-9. Summary: A young girl named Molly Lou Melon follows the advice of her grandmother in order to transform her supposed “flaws” and view them as gifts instead for the benefit of herself and everyone around her! When she moves to a new town and faces the school bully, Ronald Durkin, Molly Lou is able to practically apply her grandmother’s wise advice and overcome even Ronald Durkin’s negative comments and opinions. 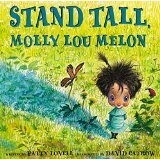 Literary elements at work in the story: Stand Tall, Molly Lou Melon, is a work of realistic fiction about a tiny little girl named Molly Lou Melon. The author uses a repeating theme which describes one of Molly’s perceived disadvantages (e.g., “Molly stood just taller than her dog”), her grandmother’s advice to overcome that challenge (“Walk as proudly as you can and the world will look up to you”), and how Molly overcomes her obstacle with confidence (“So she did”). Molly faces every challenge by taking her grandmother’s advice to heart in beautifully illustrated detail, which the author summarizes repeatedly in the phrase, “so she did.” The whimsical illustrations are instrumental in helping the reader fully experience the ways in which Molly embraces her physical limitations and turns them into flourishing gifts instead of disappointing disadvantages. How does the perspective on gender/race/culture/economics/ability make a difference to the story? Molly Lou Melon, although light-skinned, is not a character that can be positively linked to any one race or background. The illustrations show us that although her home is unique, it is in no way over-privileged or perfect, as the chipped paint on the walls and on the outside of the house indicate. Molly Lou’s friends and schoolmates represent a wide spectrum of our culture’s differences, which express her acceptance of others despite their appearances or personal challenges. Theological conversation partners: So often we wish that God had given us different looks, different qualities or different spiritual gifts. Short people wish they were tall. Tall people wish they would not stand out above others. People with curly hair wish for and go to great lengths to have straight hair and so on and so forth. Our wish for different gifts more often goes far deeper than our physical appearance. We wish we were better neighbors, better students, better communicators, more organized, more outgoing, or more faithful. The list goes on and on. Molly Lou has internalized (as should the rest of us) that our personal attributes, from looks to spirit, are gifts we have been given and that should be proudly and graciously shared with the world, because those are the specific gifts that God intended for each of us to have. God intends for each individual to proudly and gladly use the talents and gifts that we were given to share His positive and loving message of grace and kindness. God did not intend for you or me to be anyone else other than who we are, and he calls us to use those personal gifts to brighten our individual corners of the world. So……who are you? 1 Corinthians 12:4-6, 1 Peter 4:10 and Matthew 5:15 are appropriate Scripture verses to use with this book. What qualities do you possess that you feel put you at a disadvantage to others. How can you frame your perceived disadvantage and see that quality as a gift instead of a hindrance? Do you have a voice of wisdom in your life like Molly Lou Melon’s grandmother? How has that person shaped your view of yourself and others? Are you that voice of wisdom to others or one other? Why do you feel it is important for someone to internalize the uniqueness of their own special gifts? Molly Lou Melon barely says a word to her new school nemesis, Ronald Durkin, yet she is able to win him over to understanding in the end. What do you think Jesus would tell us about how Molly Lou chose to respond to someone who insulted and underestimated her? Stand Tall, Molly Lou Melon by Storypath is licensed under a Creative Commons Attribution-NonCommercial 4.0 International License.